A clip from the report's map of pedestrian deaths in this area between 2005 and 2014. The Albany metro is one of the nation's safer large metros in terms of pedestrian deaths, according to analysis out this month by Smart Growth America. Each year the advocacy org releases a report called "Dangerous By Design" that tracks and compares pedestrian deaths across the nation's 100 (or so) largest metros. The rankings for other New York metro areas: Syracuse (#99), New York-Newark-Jersey City (#95), Rochester (#91), Buffalo-Cheektowaga-Niagara Falls (#72). The metros pegged as most dangerous were mostly in Florida and other Sun Belt areas. The report also ranks states -- New York ranked 38th out of 51 (including DC) for highest Pedestrian Danger Index. We must use every tool available to improve safety for pedestrians. Public awareness campaigns around drunk or distracted driving, speed limit enforcement, and reminding pedestrians to cross streets safely are all important parts of this effort. So is better, safer street design. The data show that street design matters. Multiple studies have found that reducing the number of travel lanes and installing median islands have substantially reduced all crashes, including those that often result in serious injury or death for pedestrians. Reducing speeding can be similarly lifesaving. Nationally, speeding causes nearly one-third of all traffic fatalities each year, or close to 10,000 deaths. Speeding increases the likelihood of crashes with people walking and also it increases the probability that those crashes will cause injuries that are far more serious. At 20 mph, the risk of death to a person on foot struck by a vehicle is 6 percent. At 30 mph, that risk of death is three times greater. And at 45 mph, the risk of death is 65 percent--11 times greater than at 20 mph. When struck by a car going 50 mph, pedestrian fatality rates are 75 percent and injury rates are more than 90 percent. ... Policy, design, enforcement, and culture can also be part of the solution. Understanding how people use--and want to use--streets and public spaces is the first step. People walk along dangerous roads despite the clear safety risk. This is not user error. Rather, it is a sign that these streets are failing to serve the needs of everyone in a community. This area has already seen some of the interventions recommended in the report, such as the introduction of the Madison Ave Road Diet last year in Albany. But there's room for improvement. Despite the relatively good performance of this area, there were still 90 pedestrian deaths between 2005 and 2014. 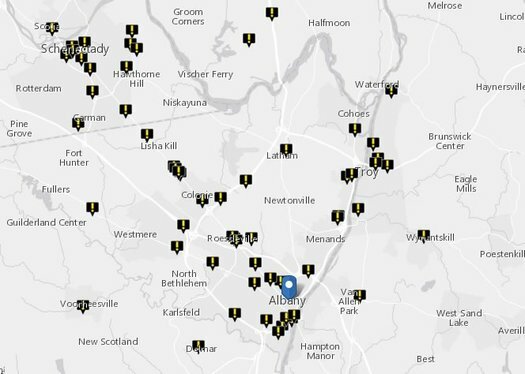 And as the report's interactive map of pedestrian deaths highlights, there are apparent trouble spots such as the Central Ave/Route 5 corridor. "When struck by a car going 50 mph, pedestrian fatality rates are 75 percent and injury rates are more than 90 percent." Soooo.... 10 percent of people hit by vehicles at 50 mph not only live, but are uninjured? How is that possible? The people irresponsibly operating heavy machinery in ways need to be held accountable. Ticket jay-driving!